Rascarrel bay where the lodges are located has a wonderful rocky beach perfect for exploring rock pools. There is also a coastal footpath that meanders across the clifftops leading to Balcary Bay, however please be aware that the cliffs are unfenced. Kippford Village has a number of small shell beaches dotted along the coast. Wandering round the village you may spot the odd piece of beach artwork and the village itself has two pubs (both of which serve food), some shops, a marina with slipway and a Yacht Club. Coastal walks link up with Rockcliffe Village. Rockcliffe Beach is a secluded bay with toilets and parking nearby. The Garden Tea Room near the road entrance of the village offers light refreshments, light lunches and homebaking. The tearoom is open all year round everyday except Monday and Tuesday from 10.30am until 5pm. 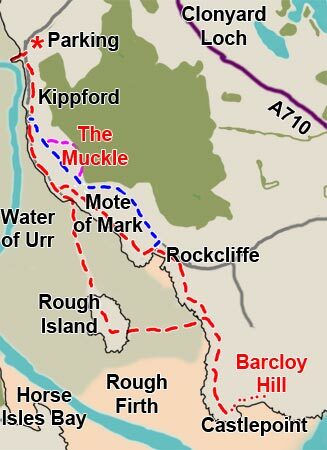 Much of the surrounding land is owned by the National Trust Scotland and there is a network of coastal walks including the Jubilee Path, which wanders it's way through woodlands to Kippford, the Rockcliffe to Castle Point walk which goes to the remains of an Iron Age dun and the Muckle Walk a circular forest and coastal walk. Out in the bay you can also see Rough Island which is a 20 acre bird sanctuary. It is possible to walk to the island during low tide but as always check the tide times before heading out and please do not visit the island during May and June when the birds will be nesting. Sandyhills Beach, is a large and sandy beach great for sunbathing, picnics and walks. There is a cafe and shop behind the beach and a coastal footpath running along the cliff tops, which leads on to the villages of Rockcliffe with its secluded bay and Kippford which has a pub, marina and some lovely shell beaches. Other beaches along the Solway Firth in South West Scotland include Mossyard and Sandgreen. All three are worth a visit if you are exploring further afield and are looking for somewhere to have a picnic or even just to stretch your legs. Mossyard Beach is a small sandy bay under an hours drive away and is European designated bathing water suitable for swimming. These sandy beaches, both under an hours drive, are suitable for swimming.